Roughly 10 years ago I was asked to contribute to an anthology of William Burroughs … well, I’m not sure criticism is the correct word here, and I wonder about scholarship, at least in the sense of traditional, received notions of scholarship. What the hell was it? Perhaps I can best describe the anthology as a collection of essays positioning the word and thought of William S. Burroughs in an age wherein many of the concepts Burroughs explored in his own essays and fiction had begun to flower (to our benefit, detriment, or both). 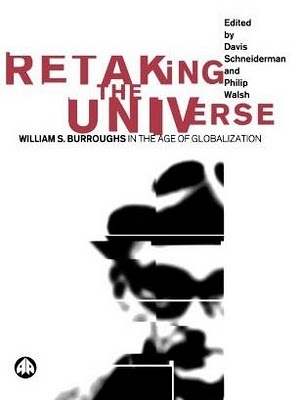 If you’re interested, you can now come to your own conclusions about Retaking the Universe–William S. Burroughs in the Age of Globalization. And you can do so free of charge. Originally published by Pluto Press, the book is now available for free download from Reality Studio, the online William S. Burroughs community. My essay (if you can call it that), which lies at the nexus of my fiction, my Burroughs scholarship, and my interminable career in high-tech and internet-related organizations, appears on page 116. It bears the title of this post.